I’ve been teaching industrial robotics at the undergraduate level for nearly a decade already, first using FANUC robots, then using ABB robots. I am able to program advanced functions in the robot programming language of ABB robots (RAPID), but I doubt I still remember how to program an ABB robot from beginning to end. I therefore had butterflies in my stomach when I had to replace one of my graduate students at the very last minute, on the set of an ad shoot for a major carmaker. Our UR5 was supposed to do nothing more than move around with a lunch bag in its two-finger Robotiq gripper, but still, I had never used the UR5 before. Well, not long after unpacking the UR5, I was quickly relieved. Not only was I able to “program” the UR5 in ten minutes, I even had time to read most of its only-hundred-page user manual, while waiting for the film director to decide whether the robot gripper should hold a lunch bag or not. I even showed one of the decoration technicians how to use the UR5. I now have no doubt that the UR5 is by far the most intuitive industrial robot out there. I can’t believe no one has thought before of developing such a simple robot user interface. On the day of the shooting, I was horrified when one of the axes wouldn’t initialize. Fortunately, after restarting the controller, the problem disappeared. But this made me think why should the UR5 be the only modern industrial robot that needs homing after restarting the controller, and even after an E-stop. This is very irritating, particularly given the fact that the robot often bumps into itself or into its end-effector, during initialization, due to its offset wrist. Another annoyance is the teach pendant’s cable. It’s twice thicker than the teach pendant cables of FANUC or ABB robots, for example, and quite rigid too. Also, the cable junction at the teach pendant is not solid and came out loose pretty quickly. Finally, while grabbing the end-effector and moving the robot around is one of UR5’s greatest features, moving the sixth axis is very difficult. If you have manipulated before a force-controlled robot or KUKA’s LBR iiwa, you will surely be disappointed, but hey, the latter costs nearly US$200,000. One of the most frequent questions that I hear regarding our UR5 is whether it is really safe? There is no simple answer. While the UR5 is definitely safer than a similarly sized industrial robot (e.g., ABB’s IRB 120 or FANUC’s LR Mate 200iC), since it is much slower, there is no doubt that the robot can hurt someone. Furthermore, if the weight of the end-effector is larger than the one specified via the user interface (e.g., if the user forgets to specify the weight), the robot falls down when the “free drive” button on the teach pendant is pressed (because it thinks the user is pushing it downwards). There are several additional glitches that we have identified, but these will be discussed in a separate post. I think that no industrial robot integrator will install a UR5 robot immediately next to a human operator, as if it were KUKA’s LBR iiwa, Rethink Robotics’ Baxter, or ABB’s Dual Arm Concept Robot. Yet, Universal Robots states that 80% of its robot arms work with no safety guard. It doesn’t say, however, if a proper risk assessment was made for each installation. After all, the advantage of UR5 and UR10 is that you don’t need an engineer to install and program them… So who does the “thorough risk assessment” then? You can get a UR5 for about US$30,000. That’s certainly not expensive considering the fact that you will not need to hire an engineer or purchase expensive safety equipment, but does this make the UR5 “low-cost”? For about US$23,000, you can get a conventional small industrial robot from ABB, the IRB 120 (which is made in China, by the way). Surely, in automatic mode, the IRB 120 can be more harmful than the UR5, but if used in manual mode, it is as safe as the UR5 (though, of course, you will need to hold the dead man’s switch pressed). Yet, the IRB 120 is much more precise, doesn’t need homing, and comes with inexpensive powerful offline simulation software (RobotStudio), integrated air supply, a reconfigurable user interface, etc. So basically, the real advantage of the UR5 seems to be its patented user interface. But it only takes a cheap force/torque sensor and a bit of programming (e.g., using ABB’s Robot Application Builder SDK) to develop something similar. Universal Robots has just moved to new much larger facilities in Denmark and its manufacturing costs will eventually start to go down. But the UR5 and the UR10 are relatively easy to imitate, unlike Rethink Robotics’ Baxter, for example. Indeed, MABI, a small Swiss family business manufacturing machines for sheet metal transformation, just released what looks like a twin of the UR10. The Speedy 10 is similarly priced but has 18-bit absolute encoders and a KeMotion controller by KEBA. Furthermore, it has a simpler wrist that causes no mechanical interferences (when no tool is attached). 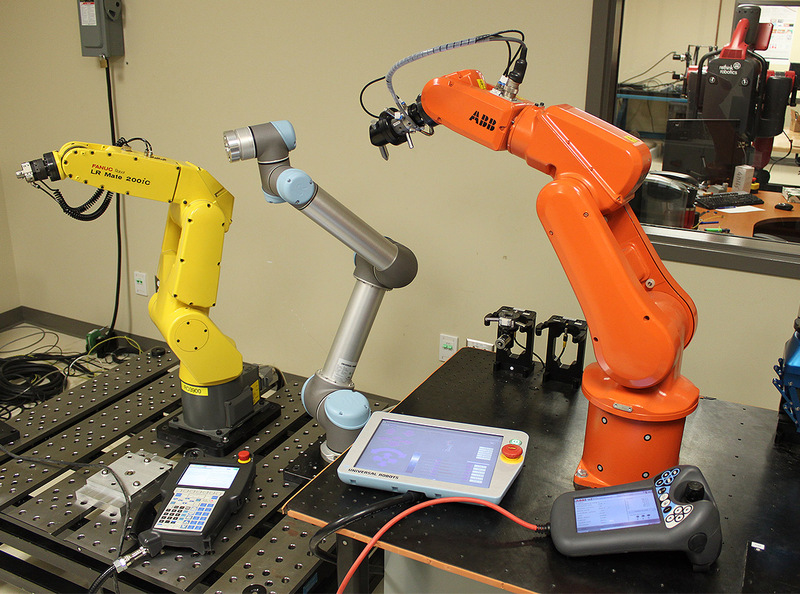 Universal Robots is definitely here to stay, especially if a major manufacturer purchases it. However, it must improve its collaborative robot arms and reduce considerably their price, if it wants to continue its impressive ascent. That said, I must admit that we couldn’t wait and just purchased a UR10 and a second UR5.